Michael Gasser, a member of the Ecosocialism Working Group of Solidarity, interviewed Alan Thornett in London on July 19, 2015, to discuss the organizing around the forthcoming Conference of the Parties (COP) of the United Nations Framework Convention on Climate Change. MG: Why does Paris matter? AT: I think there are two main reasons that make the mobilization for the Paris COP so important. I’m not sure which is the most important. One is that a binding global agreement is an essential component in tackling climate change. The projected date for the arrival of a 2 degree (Centigrade – or 3.6 degrees Fahrenheit) rise in the global average surface temperature over pre-industrial levels is coming down all the time. It’s now estimated to be 2038. That’s when, with the best face on it, a big feedback process will start to kick in and the whole thing goes out of control. Some people argue that 2038 is a conservative estimate. Right now is probably the last chance to get an agreement that can actually influence the 2 degree rise. The COP conferences only happen every five years, and 5 more years could be too late. I don’t think it’s catastrophist to say that. The other is about building the movement. Paris is crucial because it is about building the movement. The demand for a binding global agreement needs to go alongside the struggle to build a grassroots and activist movement that can take the climate struggle forward. This is the really important idea to get across. 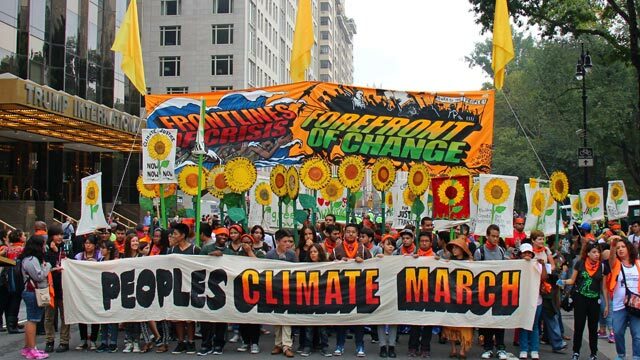 The New York City climate march, September 21, 2014. This has been the approach of the organizing committee set up in May in London to organize for Paris. It does not see itself as organizing for Paris but organizing through Paris in a continuity of action. It is already fixing dates for events in 2016, to build on the momentum of the Paris events. The objective is to come out of Paris with a stronger global movement against climate change than when we went in—the reverse of Copenhagen (2009). In Copenhagen, there was a huge demobilization when nothing came out of it. We can’t afford for that to happen again. With Paris we have to deal with the aftermath before it happens. MG: What sort of aftermath could we expect? What could possibly come out of Paris? AT: Nothing is going to come out of Paris that will be adequate to the problem. That has to be our starting point. That’s why it has to be about building the movement. Any global agreement that can be won in Paris towards combating climate change is important since a repeat of Copenhagen would be a disaster. We know in advance, however, that it will be inadequate and that the struggle will have to be stepped up. MG: What about those who would say that this whole process is flawed, that the best thing that could happen is that in a sense it be shut down and replaced by something else that might have a chance of coming up with something? AT: We have to place the responsibility on governments and demand that they take action. We have to demand action both internationally and nationally. There is only one climate. This is the ultimate international issue. Even an inadequate global agreement is better than a complete collapse and nothing. No doubt governments will try to get out of an agreement if it happens, but it would push things in the right direction. It would be something to defend and build on. MG: There are still those who would say that the process is so dominated by capitalists that they’ll put a spin on it, and part of our task is to cut through the spin. AT: Yes they will put a spin on it, and we need to cut through it. But unless we’re in a position to challenge capitalism worldwide and replace it with socialism in the short term we are working within capitalism. MG: We’re stuck with that. AT: Unless we think that world socialist revolution is likely to take place within the next 20 years, and I would suggest that that is unlikely, we have to struggle against climate change under capitalism. We can’t just wait for socialism. The reality is, that unless we can fight effectively to defend the planet under capitalism, we won’t create the conditions to end capitalism and create a socialist, I would say ecosocialist, society. MG: Tell me more about this campaign within the United Kingdom that’s mobilizing for Paris. How broad is it? AT: It could hardly be broader. The initiative to call the meeting was taken by Friends of the Earth. It was an open invitation to anybody and everybody interested. And they all turned up. All the big NGOs were there: Avaaz, Christian Aid, Oxfam, Greenpeace, Islamic Aid, the Climate Change Coalition, the Campaign Against Climate Change, the Green Party, Left Unity, a smattering of trade unions, groups like Plane Stupid that campaign against the expansion of Heathrow Airport, campaigns against fracking, even wider campaigns like the Royal Society for the Protection of Birds, for example. Incredibly broad. In Paris there are three main mobilizations. The first is the first weekend, which is the 29th and 30th of November. There is an international appeal for demonstrations everywhere on that weekend. Here in Britain a demonstration has been called for Sunday, the 30th, in London. There will also be demonstrations in Glasgow and Dublin and Belfast. In London the expectation is for 100,000 people. Then are also a series of events in Paris during the COP itself. I don’t have the details of this but it is clear that it is very diverse. Finally, there is a mass demonstration in Paris at the end of the COP. On Saturday December 12. The focus of the demonstration will be to carry the struggle forward. In London the plan is to take tens of thousands to the demo. Plans have been discussed to hire a Eurostar train, for example, and a fleet of coaches to take people to Paris. The coalition in Paris is making available 50,000 spaces for that weekend. The coalition in Paris has 200 main organizations sponsoring it, which includes the whole of the trade union movement apart from the right wing, for example. There’s a very substantial coalition, already by far the biggest thing that’s happened in France to date on climate change. MG: You mentioned that there was only a small representation of trade unions within the coalition in the UK. Is that a problem? AT: Yes. It’s hard in the unions. The unions represented at that meeting were UNISON—which was good; UNISON is a big union—PCS, civil service union, and the GMB, which is engineering. How much they will contribute I am not sure. Those with the very big commitments to Paris in London are the NGOs. They have big resources and they can offer staff for the campaign. The Campaign Against Climate Change demonstration, March 7, 2015. 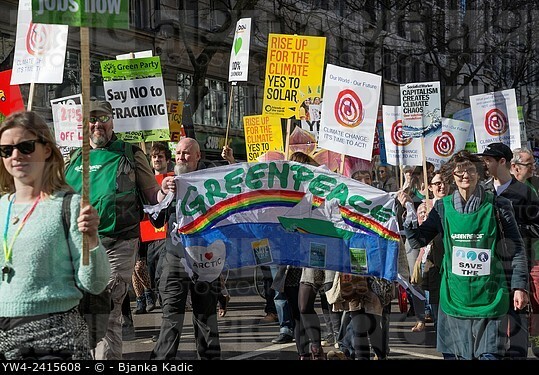 Climate change mobilization in Britain has been going up in the last year. Last September there was a demonstration called the People’s Climate March, and that was organized mainly by NGOs, Avaaz in particular. And they got 40,000 in London. The Campaign Against Climate Change, which is a more radical left wing campaign, organized a very successful demonstration on the 7th of March and got 20,000. The NGOs were there but they didn’t put big resources behind it as far as I can see. With Paris they will. MG: But what about the people who feel discomfort with working with NGOs that seem to be in charge of the show? There are those who look at what happened in New York City and are impressed by the numbers and the diversity and others who feel that the message is so watered down that it’s not worth their time. MG: Tell me a little bit about what ecosocialism is like in the UK, who the different players are, whether there is anything like a movement. AT: There are almost no players. And it’s not getting any better. The fact that there’s a rise in the climate movement and campaigning against climate change is not reflected in people on the Left moving towards ecosocialism, unfortunately. MG: But now you have, for example, the Green Left, who are explicitly ecosocialist. You have Left Unity, which is explicitly ecosocialist. AT: As far as I can see Socialist Resistance and the Green Left are the only organizations on the British left that can claim to be ecosocialist—or define themselves as ecosocialist. Left Unity aspires to be ecosocialist but it is not there yet. It has good policies on ecology and climate change but it struggles to put them into practice or to focus on the issue. Most of the far left, although some have good individual activists on the issue, are not even moving in that direction. There is an objective problem, it is true. There’s such a massive attack going on here, against public services, against employment rights, and everything else, that it tends to drown out climate change and ecological issues. I get torn myself. At the moment I am trying to write both about climate change and the situation in Greece. But this does not really answer the question. There are deep-seated obstacles in the far left tradition that need to be overcome. MG: So how strong is Socialist Resistance now? AT: We have just 100 comrades. Our members are committed ecosocialists. We set out to be an ecosocialist organisation and to have an ecosocialist practice. All the political documentation of Socialist Resistance is in an ecosocialist framework. We seek to integrate ecology into everything do. Our next public event, for example, on September 26 in London, is on Imperialism, Globalization, and Climate Change. We have a principle that we don’t do anything that doesn’t have a climate dimension. At least we’re very reluctant to do anything that doesn’t have such a climate dimension. Even then we struggle to make the grade in terms of a consistent ecosocialist practice. Alan Thornett is a leading member of Socialist Resistance in Britain, and of the Fourth International.